Rick Nash is the most important addition to the New York Rangers and arguably the best player to change teams this offseason, with no disrespect to Zach Parise or Ryan Suter and the Minnesota Wild. 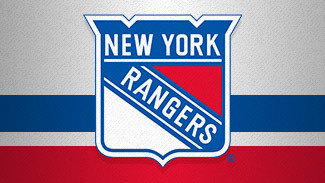 The Rangers petered out during the Eastern Conference Finals, losing to the New Jersey Devils in six games. One reason for them clearly running out of gas was the fact their first- and second-round series went seven games, when an offense that was slightly above average during the regular season (11th, 2.71 goals per game) became a hindrance in the postseason (2.15 GPG). Adding Nash at the expense of Brandon Dubinsky, Artem Anisimov, Tim Erixon and a first-round draft pick should help alleviate that problem. Nash can play either left wing or right wing, and the 28-year-old has scored at least 30 goals in seven of his nine NHL seasons, reaching 40 twice. At 6-foot-4, 219 pounds and with great speed and hands, he has been creating his offense without the luxury of a top-end center for most of his career. That will change when he's riding shotgun with Brad Richards this season. "We're happy to have a five-time All-Star on our team and a 40-goal scorer and a guy that's only 28 years old," general manager Glen Sather said. "He's one of the better goal scorers in the National Hockey League and he'll help us immensely." Along with a new home come new expectations for Nash, who reached the Stanley Cup Playoffs once while with Columbus. The Rangers, meanwhile, came within two wins of reaching the Final and are built to contend again this season. "I'll embrace it great," Nash said. "I think in 2010, I had the most pressure on me in the Olympics being in our home country. I feel like hockey is truly a passion here where they expect the same championship-caliber team. I think they've done everything they can as an organization to put that together and I think pressure is a great thing if you use it in the right way." 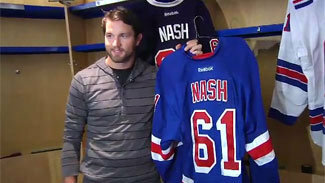 Nash is just one of many new faces for the Rangers, who parted with several key contributors this summer. Along with Dubinsky and Anisimov, Brandon Prust, Ruslan Fedotenko and John Mitchell have all found new homes. Prust was given a massive raise by the Montreal Canadiens, who signed the gritty forward to a four-year, $10 million deal. Fedotenko signed with the Philadelphia Flyers and Mitchell took his services to the Colorado Avalanche. To replace Prust, Fedotenko and Mitchell, the Rangers added Taylor Pyatt, Jeff Halpern and Arron Asham. Pyatt left the Phoenix Coyotes to sign a two-year deal with the Rangers. The left wing will turn 32 this month and fills the void left by the departure of Fedotenko. Pyatt had nine goals in 73 games last season. Asham will take over Prust's enforcer role. Asham, 34, had five goals in 64 games last season and will see most of his time on the right wing of the fourth line. Last season, Halpern was a member of the Capitals team that lost to the Rangers in seven games in the second round. The 36-year-old center is excellent on faceoffs and could be an upgrade over Mitchell if he can stay healthy. The big question for the Rangers entering camp will be which forwards will be used on the penalty kill. Dubinsky, Fedotenko, Anisimov and Prust were four of the seven most frequently used forwards while the Rangers were shorthanded last season. Halpern has plenty of experience in this area, but Asham and Pyatt didn't spend a single second killing penalties last season. Nash averaged 39 seconds of shorthanded ice time per game with the Jackets last season, 10th-most on the club. The Rangers will likely enter 2012-13 with the same defense corps they used for most of last season. The one wild card is Michael Sauer, who missed 63 regular-season games and all of the postseason because of a concussion. Sauer has shown signs of improvement, according to the Rangers, but whether he'll be ready for training camp remains to be seen. One player who won't be ready for the start of the regular season is Marian Gaborik, who will be recovering from surgery on a torn labrum in his shoulder until November. If the Rangers do not add anyone else between now and the regular season, that could leave an opening for prospects J.T. Miller or Christian Thomas or tough guy Micheal Haley, who was signed to a two-way deal this summer.